Lo-tech TRS-80 IDE Adapter – Now Bootable! 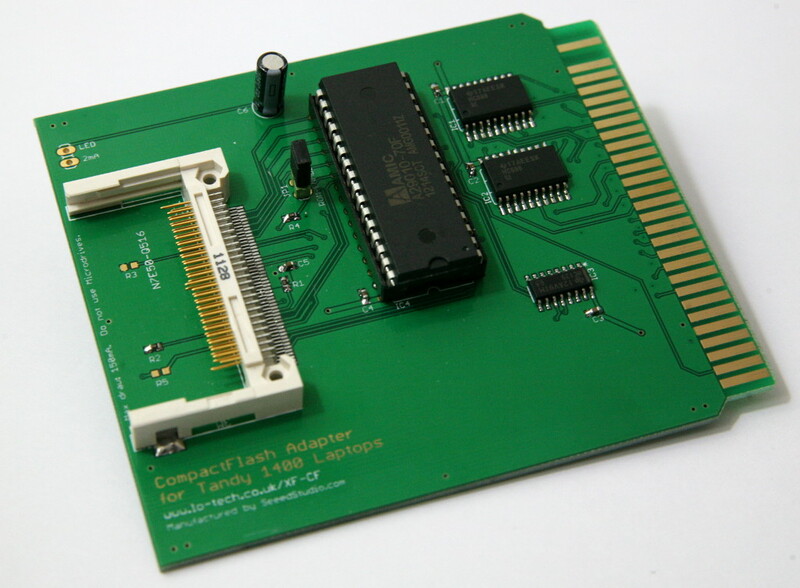 The Lo-tech TRS-80 IDE adapter is an external IDE storage adapter for Tandy TRS-80 model 3/4/4P PCs, enabling connection of standard IDE drives (and CompactFlash cards, with an adapter). A limitation has been that the machines needed to be booted from floppy disk still, since there is no HDD boot code in the Model 3 and 4 ROMs, and the HDD boot code in the 4P ROM is expecting a WD1010 controller rather than an ATA drive. Currently this has been tested with a number of hard disks (full list in the download) but doesn’t currently work with SD cards. Some DoM devices can though be used, this one having been tested OK. Gazza has kindly put together a RAR achive with the patched ROM binary along with very detailed documentation, which is available via the Lo-tech wiki now. No more floppy disks needed for your 4P! Product links have been included here for convenience; Lo-tech has no connection with the sellers. 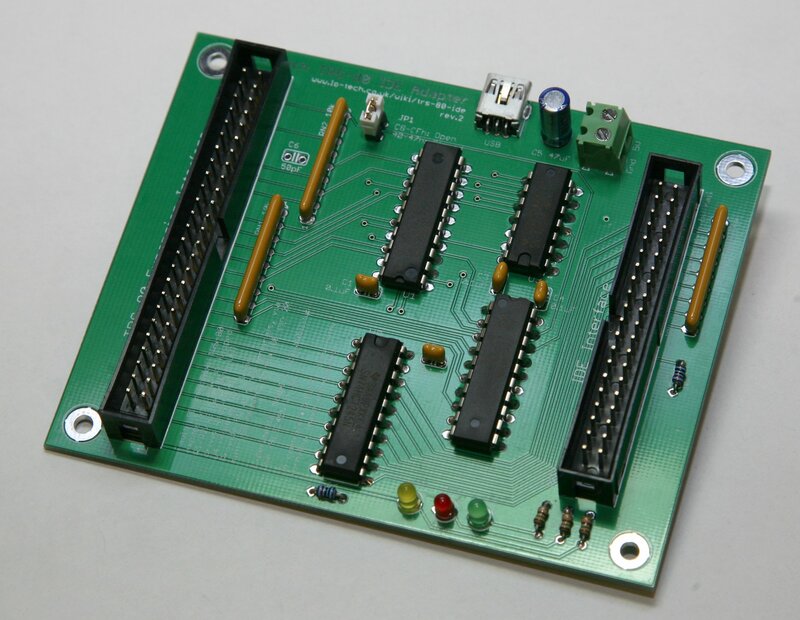 A thread on vintage-computer.com forum recently caught my eye, member Firebox have breadboarded a simple and low-cost IDE adapter based on a design by Larry Campanell for the TRS-80 Model 4 range, enabling connection of standard IDE drives. It seemed like an ideal project to turn into a lo-tech PCB. It turns out there’s already a bootable IDE solution, the FreHD project, providing access to disk images stored on a FAT32 formatted SD card powered by a PIC microcontroller. It does look fantastic, but I felt there could be space for something simpler (and so cheaper) as well. I did have one problem, though — not all IDE drives would work….only one of the four IDE drives I tried would work. That sounded familiar – I’d been through the same developing the CPLD logic for the XT-CF series. When the CPU accesses a device, it first provides the address (IO Port) then the read or write signal. In the Z80 world the CPU generates the same address, read (RD) and write (WR) signals for memory or IO port addressing, the two being distinguished with IO-Request (IORQ) or Memory Request (MREQ) signals. In the TRS-80 expansion interface (model 3/4/4P), the system combines IORQ, RD and WR signals to provide simple IN and OUT signals along with the address bus, also providing IORQ and M1 signals for reference which can be used to identify interrupt acknowledgement. IORQ is asserted concurrently with IN or OUT, so the logic has a timing issue since the IDE interface expects its chip-select (i.e. address match) line to have been asserted before the read or write command. 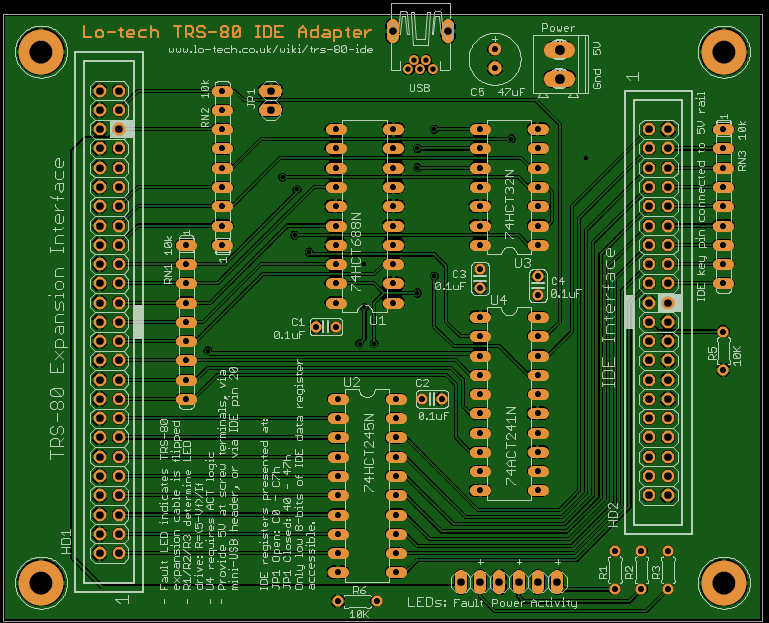 Further information on the board including bill of materials, device drivers and design files can be found on the Lo-tech TRS-80 IDE Adapter wiki page. PCBs are available now through the lo-tech shop page. Tandy helpfully included an expansion slot in their 1400 series of laptops, and in places there is reference to an expansion box, but it seems it never made it to market. The later 1400FD and 1400HD models retained the expansion slot and added a second (slightly different) slot for an MFM HDD controller, as implemented in the 1400HD. Based on the information available in the Tandy technical reference, I’ve created a wiki page detailing everything about the expansion slots. Some of the Tandy documentation is contradictory, but my wiki is based on what is now a proven design. I’ve also included an Eagle layout for the PCB (restricted to a 100 x 100mm footprint, to enable low-cost manufacture by SeeedStudio). My XT-CF cards provide hard disk functionality to PC/XT and PC/AT class machines based on CompactFlash (or microdrives), and for the Tandy 1400 the design needs just four ICs – a flash ROM, two 74688 address decoders and a 74139 decoder. Being XT-CF compatible, the design is fully supported by the XTIDE Universal BIOS (from build r554). I built this board a while back, and although BIOS flashing went OK the machine didn’t want to initialise the XTIDE Universal BIOS. The BIOS was clearly detecting the option ROM as the floppy seek test was performed on only the first floppy with it present (the BIOS assuming that an HDD would be installed in place of the second floppy, exactly as the 1400HD was shipped), but the BIOS initialisation messages never appeared. XTIDE Universal BIOS can now be initialized if non-standard main BIOS does not call INT 19h or if INT 19h handler is replaced by some other BIOS. The solution isn’t quite perfect – the fixed disk is inaccessible when restarted via CTRL-ALT-DELETE, but since boot time on this machine is identical for both soft boot and cold boot, this is just something that we need to live with for now. For 1400FD systems at least with BIOS 1.04, the system BIOS assumes the second floppy isn’t installed when the XT-CF option ROM is present (this may also affect 1400LT systems). For now this is a limitation, but with 32KB of flash ROM available it should be possible to resolve it by adding a floppy BIOS to the card. For 1400HD machines, the MFM controller must be removed since both cards have their BIOS at C800h (upper memory space is somewhat limited in the 1400 series as Tandy included RAM in the upper memory area for use as a RAM disk). Using the ‘XTplus’ XTIDE Universal BIOS build (thanks to the V20 CPU), DOS throughput (as measured with my own test utility) is at least 550KB/s. Due to the 8-bit data bus and V20 microcode optimisations, there is no performance difference between standard 8-bit PIO and BIU offload modes (as set with XTCFMODE), although both modes are supported. ENIG PCBs (gold plated) are available now through the shop page. Components will also be needed from your local electronics outlet such as Farnell, Mouser or Digikey – full Bill of Materials in the wiki. There is no bracket needed, since the card slides into the expansion slot guides within the system chassis, and the fit into the slot is tight enough not to need and further support.